The law of Ireland consists of constitutional, statute and common law. The highest law in the State is the Constitution of Ireland, from which all other law derives its authority. 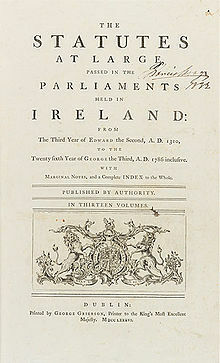 The Republic has a common-law legal system with a written constitution that provides for a parliamentary democracy based on the British parliamentary system, albeit with a popularly elected president, a separation of powers, a developed system of constitutional rights and judicial review of primary legislation. The sources of Irish law reflect Irish history and the various parliaments whose law affected the country down through the ages. Notable omissions from the list include laws passed by the first and second Dáil, and the Brehon Laws which were traditional Celtic laws, the practice of which was only finally wiped out during the Cromwellian conquest of Ireland. These latter laws are void of legal significance and are of historical interest only. The Irish Constitution was enacted by a popular plebiscite held on 1 July 1937, and came into force on 29 December of the same year. The Constitution is the cornerstone of the Irish legal system and is held to be the source of power exercised by the legislative, judicial and executive branches of government. The Irish Supreme Court and High Court exercise judicial review over all legislation and may strike down laws if they are inconsistent with the constitution. The Constitution can only be amended by referendum. A proposal to amend the Constitution is introduced into Dáil Éireann (the lower house of parliament) as a bill and if passed by the Dáil, and passed or deemed to have been passed by the Senate (the upper house), is put to the people. Only Irish citizens resident in the state may vote. There is no threshold for such referendums and a simple majority of voters is sufficient for a proposal to be passed. Once passed by the people the President signs the referendum bill into law. As of November 2011, there have been 33 such referendums: 23 of which were approved by the people and 10 of which were rejected. The constitution was also amended twice during an initial transitional period of three years following the election of the first President of Ireland, when amendments could be made without recourse to the people. Modern-day statute law is made by the bicameral National Parliament — more commonly known by its Irish name, the Oireachtas. Acts of the Oireachtas are split into sequentially numbered sections and may be cited by using a short title which gives the act a title roughly based on its subject matter and the year in which it was enacted. While the Oireachtas is bicameral, the upper house, the Senate, has little power which at most allows the Senate to delay rather than veto legislation, something that has only happened twice since 1937. Notwithstanding the declaration in the 1937 constitution that the Oireachtas is to be "the sole and exclusive" legislature, it has long been held that it is permissible for the Oireachtas to delegate its law-making power(s) to other bodies as long as such delegated legislation does not exceed the "principles and policies" set out in the relevant authorising statute. All instances of delegated legislation in the Republic are known as statutory instruments, although only a small sub-set of these are numbered as statutory instruments and published by the Stationery Office. This latter subset is composed of statutory instruments which are required to be laid before the Oireachtas or which are of general application. In addition, a body of charters, statutory rules and orders and other secondary legislation made prior to independence in 1922 continues to be in force in Ireland insofar as such legislation has not been revoked or otherwise ceased to be in force. The Supreme Court of Ireland sits in the Four Courts building in Dublin. Ireland was the subject of the first extension of England's common law legal system outside England. While in England the creation of the common law was largely the result of the assimilation of existing customary law, in Ireland the common law was imported from England supplanting the customary law of the Irish. This, however, was a gradual process which went hand-in-hand with English (and later, British) influence in Ireland. As with any common-law system, the Irish courts are bound by the doctrine of stare decisis to apply clear precedents set by higher courts and courts of co-ordinate jurisdiction. The main exception to this rule being that the Supreme Court has declared itself not to be bound by its own previous decisions. While the doctrine clearly means that the present High Court is bound by decision of the present Supreme Court, it is not altogether clear whether the decisions of courts which previously performed the function of courts of last final appeal in Ireland – such as the British House of Lords – bind the present High Court. In Irish Shell v. Elm Motors, Mr. Justice McCarthy doubted that decisions of pre-independence courts bound the courts of the state, stating that "[i]n no sense are our Courts a continuation of, or successors to, the British courts." However the other two judges on the panel hearing the case declined to express an opinion on the matter as it had not been argued at the hearing of appeal. Post-independence judgments of the British courts, and all judgments of the American and Commonwealth courts are of persuasive value only and do not bind the Irish courts. The European Communities Act 1972, as amended, provides that treaties of the European Union are part of Irish law, along with directly effective measures adopted under those treaties. It also provides that government ministers may adopt statutory instruments to implement European Union law and that as an exception to the general rule such statutory instruments have effect as if they were primary legislation. Ireland is a dualist state and treaties are not part of Irish domestic law unless incorporated by the Oireachtas. An exception to this rule might well be the provision in the constitution which says that "Ireland accepts the generally recognised principles of international law as its rule of conduct in its relations with other States." However while this provision has been held to assimilate the doctrine of sovereign immunity into domestic law, the Supreme Court have held that the provision is not capable of conferring rights on individuals. The dualist approach in international law contained in the Irish Constitution allows the state to sign and ratify treaties without incorporating them into domestic law. Thus while Ireland was one of the first states in Europe to ratify the European Convention on Human Rights it was one of the last to incorporate the Convention into domestic law. And when done it was not directly incorporated into Irish law but given indirect, sub-constitutional, interpretative incorporation. In Crotty v. An Taoiseach, the Irish Supreme Court asserted a power to review the constitutionality of treaties signed by the state, such that the government could be prevented from signing up to international agreements which would be contrary to the constitution. A ruling which has resulted in ad hoc amendments to the constitution to permit the state to ratify treaties that might otherwise have been contrary to the constitution. Byrne, Raymond; McCutcheon, Paul; Bruton, Claire; Coffey, Gerard (2014). Byrne and McCutcheon on the Irish Legal System (6th ed.). Bloomsbury Professional. ^ Coakley, John; Gallagher, Michael, eds. (2005). Politics in the Republic of Ireland (4th ed.). Oxon: Routledge. p. 84. ^ Heuston, Robert F. (1977). "Personal Rights under the Irish Constitution". U. Brit. Colum. L. Rev. 11: 294. Retrieved 19 February 2011. ^ Hogan, Gerard; Whyte, Gerry (2003). JM Kelly: The Irish Constitution (4th ed.). Bloomsbury. p. 396. ISBN 9781845923662. ^ Cityview Press v An Chomhairle Oiliúna  IR 381: "In the view of this Court, the test is whether that which is challenged as an unauthorised delegation of parliamentary power is more than a mere giving effect to principles and policies which are contained in the statute itself." ^ See section 1 of the Statutory Instruments Act, 1947 which defines a "statutory instrument" as any "order, regulation, rule, scheme or bye-law made in exercise of a power conferred by statute." ^ These being the ones to which—in the language of the Statutory Instruments Act—the Act "primarily applies". ^ Baker, John (2003). The Oxford History of the Laws of England, Volume VI: 1483-1558. Oxford: Oxford University Press. p. 108. ISBN 978-0-19-825817-9. ^ Hand, Geoffrey Joseph (1967). English law in Ireland, 1290–1324. Dublin: Cambridge University Press. p. 1. ^ Attorney General v Ryan's Car Hire Ltd.  IR 642. ^ Director of Public Prosecutions (Walsh) v Cash  IEHC 108. ^ Irish Shell v. Elm Motors  IR 200. ^ de Londras, Fiona (2010). Sellers, Mortimer, ed. Dualism, Domestic Courts, and the Rule of International Law. The Rule of Law in Comparative Perspective. Springer Sciences+Business Media B.V. p. 228. ISBN 978-90-481-3748-0. ^ See: Canada v. Employment Appeals Tribunal  2 IR 485. ^ See: In Re Ó Laighléis  IR 93 and Kavanagh v. Governor of Mountjoy Prison  3 IR 123. ^ It was in fact the fifth to do so on 25 February 1953 . ^ "European Convention on Human Rights Act 2003". Irish Human Rights Commission. Retrieved 27 February 2011. ^ O'Connell, Donncha; Cummiskey, Siobhan; Meeneghan, Emer; O'Connell, Paul (2006). ECHR Act 2003: A Preliminary Assessment of Impact (PDF). Dublin: Dublin Solicitors Bar Association and Law Society of Ireland. p. 10. ISBN 978-0-902027-37-4. Retrieved 27 February 2011.